Bocock Peak Provincial Park is a remote, high elevation park located on the continental divide in the headwaters of the Peace River. It contains distinct geological features such as limestone cave systems and preserves important wildlife habitat. When viewing caves, the fragile nature of these systems and the potential hazards associated with them must be recognized. Visitors should be aware of the numerous vertical openings and irregular terrain of surface karst. Inexperienced visitors wishing to view caves should consider joining a caving club. Bocock Peak Provincial Park is located south of the Peace Arm of Williston Lake and adjacent to Eleven Mile Creek, approximately 70 km west of Hudson’s Hope. There are no designated trails to this remote area. History: The Dawson Creek Land and Resource Management Plan identified the importance of protected status for this area in 1998 and subsequently it was established as a Provincial Park in 2000. Cultural Heritage: Bocock Peak Provincial Park is within the area traditionally used by the West Moberly, Salteau and Halfway First Nations. 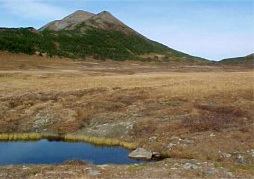 Conservation: Bocock Peak Provincial Park is located in the Hart Ranges ecosection. It contains three significant limestone cave systems, the deepest of which at 253 m is the ninth deepest cave system in Canada. Limestone cave systems (also known as Karst) are extremely fragile ecosystems that are especially vulnerable to disturbance, more so than many other land resources. The intricate relationship between the unique surface characteristics and the subsurface caves and hydrology makes for a delicately balanced system. Wildlife(specific to this park or area): Grizzly and black bear are found throughout the area. Mountain goat can be found in the upper elevations with moose in the lower valley. Numerous small mammals such as pine marten, marmots and porcupine also call this area home. There are spelunking or caving opportunities. Cycling is permitted in the park. Helmets are mandatory in British Columbia. There are no developed trails at this park. Visitors should be experienced hikers when visiting remote areas. Campfire pits are not provided, please use existing traditional stone fire rings. To preserve vegetation and ground cover, please don’t gather firewood from the area around your campsite or elsewhere in the park. Dead wood is an important habitat element for many plants and animals and it adds organic matter to the soil. You can conserve firewood and air quality by keeping your campfire small. Be prepared to bring a portable stove for cooking.